As críticas de Lavrov ao regime de Assad podem ser um sinal de que os russos estão conseguindo (já conseguiram) alguma coisa dos ocidentais em troca da cabeça do líder sírio. Claro que alguns poderiam dizer que é apenas uma manobra diversionista dos russos, mas me parece mais um sinal de que, em breve, o regime de Damasco estará sem o apoio mais contundente de seu maior aliado. O problema da deposição de Assad é quem ficará em seu lugar. A instabilidade aumentará na região, isso é fato. Preocupa-me, particularmente, o que acontecerá com os arsenais químicos sírios. E mudanças na Síria podem deixar os iranianos ainda mais acuados. As nuvens continuam escuras por lá. MOSCOW (Reuters) – Syria’s leadership has made “very many mistakes” that have aggravated the crisis, Russian Foreign Minister Sergei Lavrov said in remarks broadcast on Tuesday, seeking to distance Moscow from President Bashar al-Assad amid a diplomatic push for peace. Lavrov’s comments were some of Russia’s toughest criticism of Damascus in a year of bloodshed, but he also took aim at the West and reiterated Russia’s position that Assad’s exit must not be a precondition for a solution to the crisis. “We believe the Syrian leadership reacted wrongly to the first appearance of peaceful protests and, despite making repeated promises in response to our calls, the Syrian leadership is making very many mistakes,” Lavrov told Russian radio station Kommersant-FM. The comments appeared aimed to dispel the widespread conviction that Russia is Assad’s protector and show the world it is driven by principles, not the desire to prop up an ally who has given Moscow its firmest foothold in the Middle East. Russia has shielded Assad from U.N. Security Council censure by vetoing two resolutions condemning the government for the violence in which, the United Nations says, more than 8,000 civilians have been killed since the start of a crackdown on pro-democracy protests in March 2011. Lavrov said Russia was ready to endorse a Security Council statement or a resolution backing U.N.-Arab League envoy Kofi Annan’s Syrian peace mission as long it does not present an ultimatum to Assad’s government. “The Security Council must approve these, not as an ultimatum but … as a basis for the continuation of efforts to reach accord between the Syrian government and all opposition groups,” Lavrov said after talks with Lebanon’s foreign minister. A Western-drafted statement supporting Kofi Annan’s peace efforts and sending a strong message to Damascus to end violence was circulated on Monday by France. Britain’s U.N. envoy said he hoped it would be adopted on Tuesday. Lavrov also repeated Russia’s insistence that Syrian government forces and rebels must cease fire simultaneously – a position that differs starkly to that of the United States, which says the government bears primary responsibility for the violence and must stop first. Annan’s plan entails a ceasefire, access for humanitarian aid and political dialogue with the Syrian opposition. Russia has repeatedly called on Assad to implement reforms faster but has continued to sell weapons to Syria and, with many Western and Arab nations calling for Assad to step aside, has accused them of meddling in a sovereign state’s affairs. 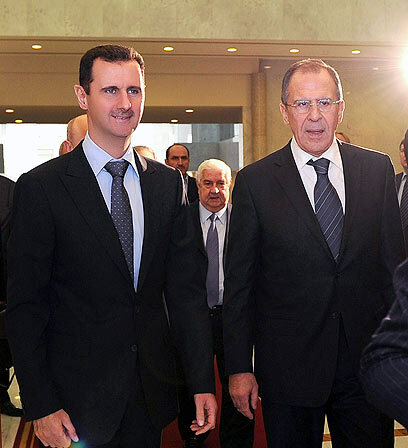 But Lavrov struck a note of indifference about Assad’s fate even as he said Russia would not press him to quit. Esse post foi publicado em Assuntos Internacionais, O Levante, Rússia/União Soviética e marcado apoio russo Siria, Assad, Lavrov, Siria por Joanisval. Guardar link permanente.